In the last few years, it seems like just about everyone has jumped aboard the Tenkara bandwagon. Tenkara seems to be everywhere in social media Facebook, Instagram, and numerous blogs. Some may argue that this is just a fad that will pass. No doubt, fads come and go, but what do you say about something that has been around for over 200 years? For those of you who don’t know, Tenkara is an old form of fly fishing invented in Japan. 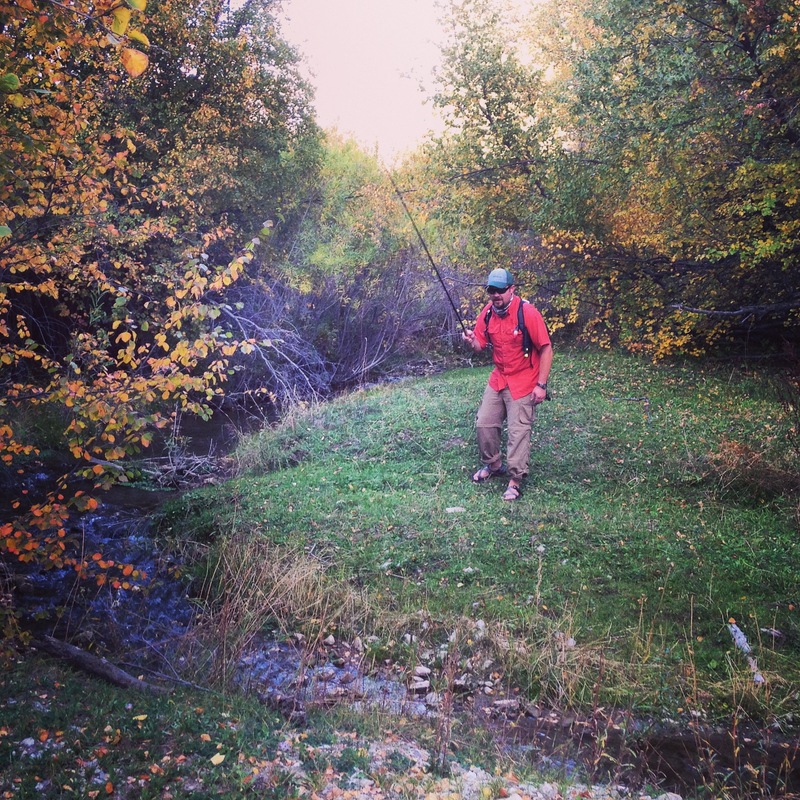 A Tenkara rod is much longer than your typical fly rod (i.e. 12 to 14 feet as opposed to 7 to 9 feet) and there is no reel. The modern Tenkara rods telescope outward. When I first read about this form of fishing, it piqued my curiosity, but—based upon the written descriptions—I really didn’t quite understand how it worked. 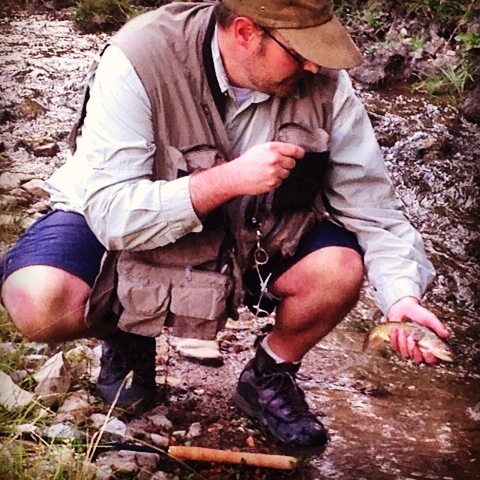 However, last fall, a good friend of mine, Matt Tower, agreed to show me how to Tenkara fish after a grouse hunt. I took him to a favorite hole on a tiny stream I call “Trickle Creek” and even filmed him catching a nice trout. Below is the video. Matt let me try it out and I instantly became a fan of Tenkara fishing and had to have one. I approached the gentlemen from Badger Tenkara—Matthew Sment and Mike Lutes—about reviewing one of their rods and they graciously agreed. I explained that I planned to fish it on small mountain creeks and asked for their suggestion. 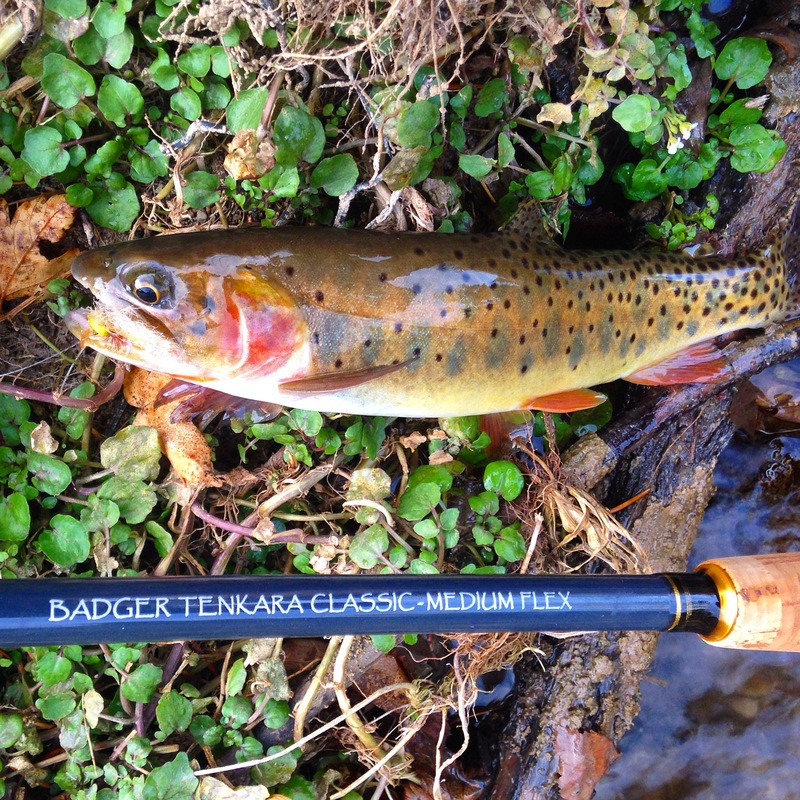 Within a week, I received the Badger Tenkara Classic-Medium Flex rod. This telescoping 12 foot rod came in a nice plastic green tube, with screw on lids that open at either end. The rod itself was in a black cloth sheath. They also sent me about twelve feet of fly line. In short, everything is super nice. 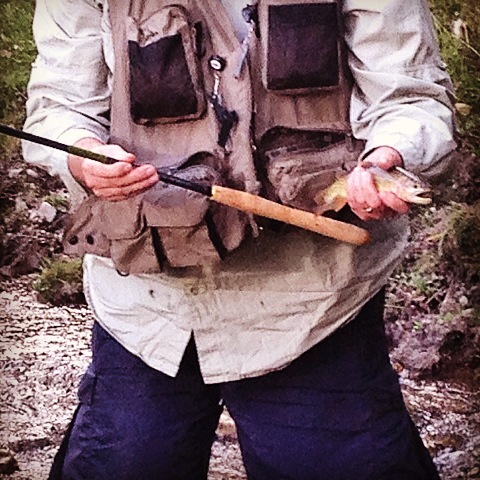 Unlike a regular fly rod, there are no ferules on a Tenkara rod. Rather, the line is attached to a small piece of woven nylon at the rod’s tip called a “Lillian.” I had to go to the Badger Tenkara’s webpage to learn how to tie the appropriate knots for the line-to-Lillian and the line-to-tippet connections. The same week I received the rod, I called Matt and we planned again to fish Trickle Creek with our Tenkara rods. Though the creek was low and clear, the numerous Yellowstone Cutts rose to nearly every well-presented fly. The real challenge was to not spook the fish with a clumsy approach or cast. I missed the first few fish as my timing was a little off with a twelve foot rod (as opposed to the seven foot rod I typically use), but I eventually dialed in and started to catch a few small cutthroat. At first, I found it a little difficult to keep the line from tangling in the tall brush around me and I snagged my fly in the trees overhead more than once. I think that comes with trying to get used to a longer rod and the loose line. Matt had purchased some line keepers from amazon.com so that when we moved to the next hole, he simply wrapped all his line on the keepers above the rod’s cork handle to keep it from tangling with all the natural obstructions that lay before us. I will definitely invest in this for this summer and fall fishing. All said, I caught numerous fish that evening and missed many others. I truly enjoyed myself, but was surprised that it was more difficult for me than I expected. Even though I do not yet have my limit of four birds, I decide that three is plenty. I turn back down the road and head for the car with a smile on my face. The only thing that would make this day any better is to catch a cutthroat out of Trickle Creek and that is exactly what I plan to do with my new Badger Tenkara Rod. Once back to the car, I load up the dogs and drive up the road to fish a favorite stretch of the creek. After stringing up the Tenkara rod, I tie on one of Shawn’s Chubby Mormon Girls and start fishing the familiar water. In a deep hole, a large yellow fish rises and I miss it. I cast the fly into the hole again and the same big cutty rises again. I stick him, but he is off in a flash. This has to be the biggest fish I have ever seen on Trickle Creek. In the skinny water, the fish are skittish, but I manage to catch four or five beautiful Yellowstone Cutthroats, none the likes of the one that got away, but special nonetheless. My love for this special canyon, its birds, its little creek, and trout abounds. And so did my love of Tenkara fishing. 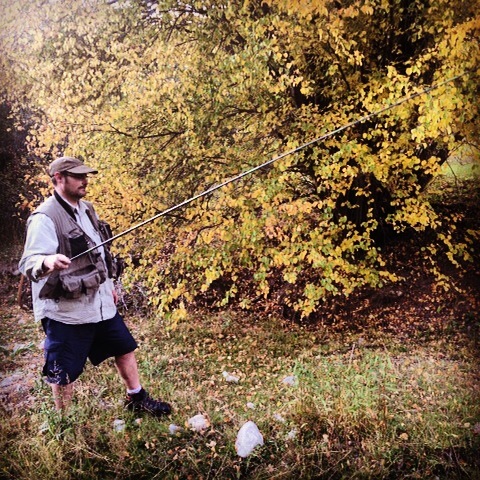 I can honestly say that the Badger Tenkara rod was perfect for what I had in mind that glorious fall day. So what do I think of Tenkara fishing? I love the simplicity of it. Notice that I did not say that Tenkara fishing is “simple” because it is not. Rather, it hails back to a time when life was simpler—when man did not have all of the conveniences of modern life but made do with what he had. In that sense, Tenkara never was or will be a passing fad. A friend of mine with whom I often fish recently teased me about taking up Tenkara fishing and said that “Fishing without a reel is like riding a bike with training wheels.” I think maybe it’s the other way around. Oh well, to each his own. As I did a little research for this article, I found that the word “tenkara” means “from heaven” in Japanese. Honestly, that made me love Tenkara fishing even more. Indeed, any fly fishing—including Tenkara—is heavenly. I appreciate Matt and Mike from Badger Tenkara for allowing me to review the Badger Tenkara Classic-Medium Flex. The rod is reasonably priced ($85.00 to $105.00) and casts great. I have no problem recommending the followers of the Upland Ways blog to Badger Tenkara for all their Tenkara needs. Matt and Mike are great guys and are more than willing to answer any questions that you have to help you get started—not to mention that Mike has great taste in music (“I want to make friends with the Badger!” –The Dead Milkmen). 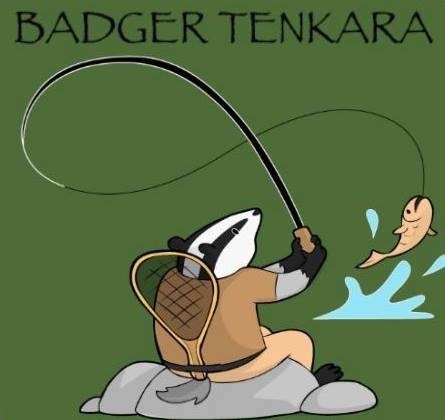 Here is the link to Badger Tenkara’s website. “I want to make friends with the Badger!! !” –The Dead Milkmen. Thanks, Andy. All new to me. Really interesting! I enjoyed the read. Thanks Rob. Hope this post encourages people to try something new. I really enjoyed this story. I too have been “interested” in Tenkara and may take the plunge this year a get a rod. It seems to be very simple and straight forward, which I like.